Fendt 200 Vario, a cluster of innovations! Fendt opens, with the Fendt 200 Vario, a new era in the specialized tractor sector. The Fendt 200 Vario is the first and only specialized tractor with continuous transmission on the market. The Fendt Vario 200 comes in standard version, in classic winemaker version and fruit version. The new Fendt 200 Vario range is equipped with new 3-cylinder water-cooled engines. Developed in collaboration with the Fendt engineers by AGCO Sisu, this engine was specially designed for the new Fendt 200 Vario. Equipped with a displacement of 3.3 liters and a power of 70 to 110 hp, this engine covers the range of current 4-cylinder engines with air cooling. This engine meets the European exhaust regulations level 3a. The compactness of the new 3-cylinder engine made it possible to integrate the new liquid cooling system while preserving the compactness of the tractor. This new cooling system has large suction surfaces. The resulting low fouling of the radiators optimizes the performance of the radiators, even under extreme conditions of use. The long service life of the Picoflex engine air filter reduces maintenance costs. Although very compact, it allows a particularly high air flow. The engine is equipped with an electronically controlled Common-Rail injection system. The high-pressure injection system is supplemented by the AGRex exhaust gas recirculation system. This combination allows fuel economy of up to 10% compared to an internal exhaust gas recirculation system. The integration of the fuel tank into the hood is not only a particular design feature. It demonstrates very clearly the desire of the design engineers to produce a Fendt 200 Vario tractor of optimal compactness. Despite the addition of additional components, such as radiators, in the engine compartment, the capacity of the tank could still be increased. When developing the Fendt 200 Vario engineers faced a major challenge: How to house the Vario technology of large tractors on more compact tractors. The new Vario ML 70 transmission has been adapted to the compactness and special features of specialized tractors. Equipped with a speed range, the Vario transmission allows speeds ranging from 20 meters per hour to 40 kilometers per hour and a progressive and wear-free engagement of the reversing gear. The maximum speed has already reached the economic speed of 1,750 rpm. The possibility of using the entire engine performance potential independently of engine speed optimizes the working speed, resulting in productivity gains of up to ten percent. The high efficiency of the Vario transmission significantly reduces fuel consumption. The absence of torque breakage enabled by the Vario transmission results in a considerable safety gain. This is particularly evident when working on hillsides. To start and to adapt its speed continuously is, even under these conditions, possible. The efficiency of the Vario transmission is clearly demonstrated during acceleration. From 0 to 40 kilometers per hour in just seven seconds. Another advantage in favor of the Fendt 200 Vario. Compared to the previous range, this equates to halving the acceleration time, hence a responsiveness and adaptability to working conditions much more secure and comfortable. Mounted on long-standing Fendt tractors, the TMS, the engine management system, makes driving even more economical. The TMS harmonises communication between the motor and the transmission. The speed is adjusted with the pedal. The engine speed and transmission setting are automatically coordinated. The tractor thus operates at optimum economy. The TMS gives the driver extra comfort and reduces fuel consumption by up to 10%. The special design of this new Vario transmission made it possible to integrate all of its components into the rear axle. The Fendt 200 Vario is the first specialized tractor to have a cabin with a flat floor. Neither transmission tunnel nor gear levers between the legs. The centralized control concept on the right side and the flat floor ensure an optimal position of the legs. The tilt-adjustable, height-adjustable steering wheel, combined with the air-suspension comfort seat, provides the driver with a comfortable seat to cope with long working days while reducing fatigue. 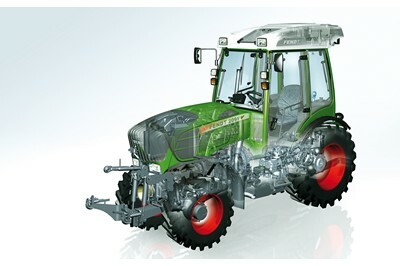 According to Fendt, the ventilation and heating system with integrated air conditioner ensures optimal working comfort. For the cold days, the heating ensures, according to the firm, through the radiator a most pleasant temperature. The silent blocks ensure a very low noise level due to the absence of contact between the cab and the chassis of the tractor. This sound level is optimized by the very good soundproofing of the cab and the flexibility of operation of the very quiet engine with liquid cooling. These costly improvements have reduced the cabin noise level by nearly 4 dbA. The Fans 200 Vario have a centralized control unit located in the right armrest of the seat. This command is similar to the one that equips the big Fendt. The joystick controls the acceleration, deceleration, reversal of the direction of travel, the cruise control and the storage of engine speed. Compared to a four-lever mechanical transmission, this simple lever offers many more features. For more specific applications, the Fendt 200 Vario can also be equipped with a "Profi" version. Equipped in this way, the joystick "Profi", in addition to its standard functions, can control up to four double-acting distributors as well as the lift and rear PTO. Nearly ten changes of hand can thus be spared during maneuvers at the end of the field. It is not only in curves but also for line work that the speed can be adjusted and the machines adjusted in relation to the work in progress. The joystick "Profi" is also equipped with electric controls for harnessed machines. Multiple control levers are thus deleted. Multi-purpose machines such as trimmers can be controlled easily using the "Profi" joystick. Optional hydraulic pump Load-Sensing and up to six double-acting distributors optimize the hydraulic control and the Fendt 200 Vario equipment. The other functions are located on the right side and on the dashboard. The new CAN-Bus as well as the reorganization of the control elements made it possible to design a new control philosophy. The comfort of controlling the main functions such as four-wheel drive, automatic differential lock, proportional valve control or comfort control of the pendulum lift are naturally preserved. The unique features that are the foundation of the satisfaction of the Fendt 200 users are maintained on the new Fendt 200 Vario. This applies, for example, to the front suspension with adjustable trim or the hydraulically adjustable pendulum lift, which is now controlled by optimized controls. The three different versions of the range, "V" for the classic winemaker version, the fruit version "F" as well as the standard version "P", are also included with the new series.